The crucial balance. The rolling properties of the rubber compound of a tyre are primarily determined by three interacting factors – stiction [grip], rolling resistance and mileage [longevity] . The dilemma: If you improve any of these factors it can have a detrimental effect on at least one of the others. A tyre with maximum grip wears quicker and rolls more slowly. If you then make a tyre roll faster and more durable, grip, in turn, is reduced. With our BlackChili Compound, a tread compound which is always based on the latest knowledge of polymers and raw material research, we have supplied the cycling industry with an enduring solution. Depending on the application of a tyre, we adjust the compound formulation for the specific discipline – for road or mountain biking, time trialling or downhill racing. How does that work? 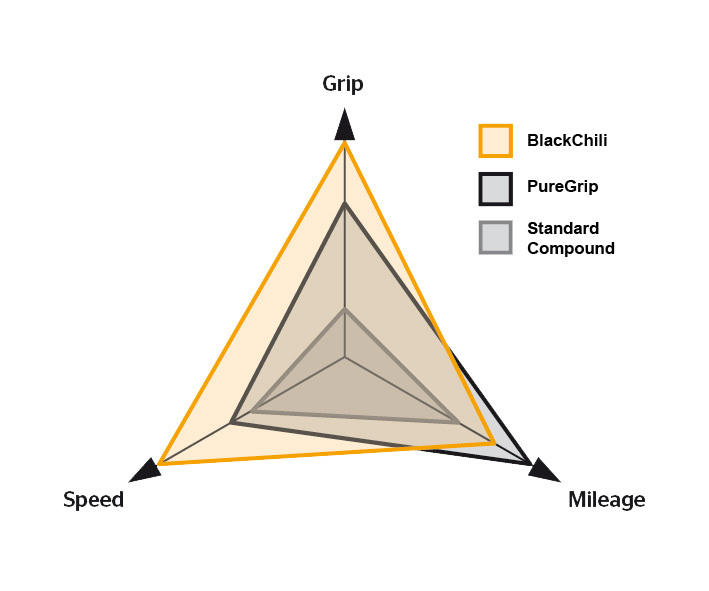 For BlackChili, we refine special synthetic rubbers with proven natural rubber to high-performance tread mixtures. To these mixtures we then add soot particles, which in turn are optimised in shape and surface properties. The complex compound technology is so sensitive that tyres with BlackChili Compound are produced exclusively in our German Korbach plant.